From Catalyst 10.2, the latest CrossFireX profiles can be downloaded in a separate executable file, ensuring users to have the absolute latest application profiles (that have not yet been added to the official ATI Catalyst release). As usual, you can download Catalyst 10.2 HERE. More information is available in this article: ATI Catalyst™ 10.2 Driver – What’s New? (actually this blog entry is a copy of the release notes, not really interesting…). Now let’s see the OpenGL side of Catalyst 10.2.
where numLights is an uniform variable. In previous versions of Catalyst, the use of a variable in the for loop led to a crash. 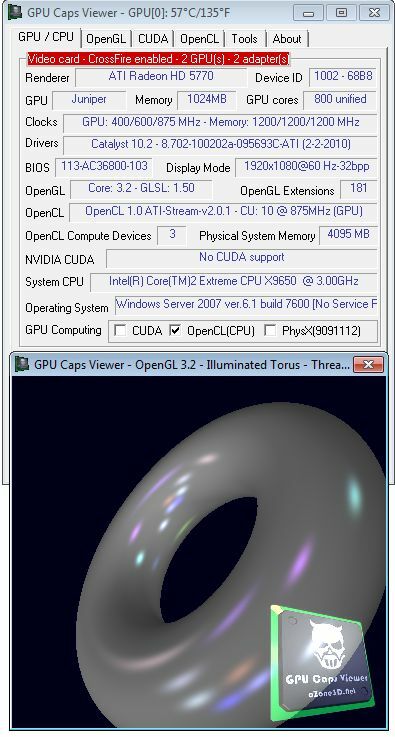 That’s why I added a batch file in GPU Caps Viewer called Start_Disable_OpenGL3_Torus_Radeon_Fix.bat. By default GPU Caps Viewer uses with Radeon, a GLSL shader with a hardcoded number of lights in the loop. This batch file allows to use the real shader with the variable in the loop. This is a really nice news. GL_ARB_fragment_coord_conventions: This extension provides alternative conventions for the fragment coordinate XY location available for programmable fragment processing. Also exposed by NVIDIA (see HERE). Two new non-ATI OpenGL extensions that are not exposed by NVIDIA. This is a rather good sign. The complete list of the 181 OpenGL extensions exposed by Catalyst 10.2 (under Windows 7 64-bit) is available in the forum HERE. I also installed the latest OpenCL SDK to quickly check the OpenCL support. The support of OpenCL is ok and all demos ran fine. See HERE for OpenCL detailed report. It’s the first time I didn’t encounter problem to enable OpenCL support on Radeon. The latest ForceWare 196.34 were installed on the system without perturbing OpenCL support on Radeon. Still no direct_state_access support. Will they ever add it?. Hopefully before it gets into GL standard. @Athlonite: currently GPU Caps 1.8.3 has no change related to OpenCL. Depending on the system, enabling OpenCL on AMD platform is a tough work! 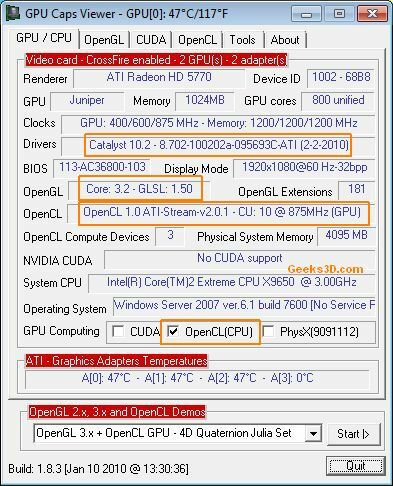 For the first time, I enabled OpenCL on AMD platform in two seconds but maybe this is due to Windows 7, I don’t know… GPU Caps 1.8.3 will be released shortly. Anyone else having problems with multi monitor setups and video playback? After I updated to 10.2 i can’t play hardware accelerated video on my primary monitor, it’s just black screen. I can’t find any differences in screen setups after the install, so seems a bit strange. After reinstalling 10.1 it works as normal again. This was on a 5850 and two 24″ 1920×1200″ monitors. Perhaps from the upcoming OpenGL 3.3 standard? Assuming OpenGL 3.3 will be announced at GDC 2010 in March (like OpenGL 3.1 was announced last year at GDC 2009). I believe that GL_ARB_blend_func_extended is dual-source color blending as is supported in Direct3D since version 10 and should be made core in OpenGL 3.3. Hi there installed these latest driver now im having issues when using crossfire as it recognises both my 5870s but when trying to adjust fan speed etc in ccc its like the second card isnt there.